Life has been pretty busy of late as I move towards finalising the last little bits of the renovations...there always seems to be something else to do. So apologies for being a bit absent from the blog front. Still during this period I have been out and about with friends Patricia and Bjarki (this will be another post), I also have had time to share this little part of the world with a dear friend Judith and her nephew George from Australia who have been traveling around Eastern Europe and Nordic countries for a month. They took the circle route around Iceland and then a slight detour off the ring road to visit me in Sauðárkrókur. An odd couple you might think...a nearly 60yr old woman traveling around with her 20 something nephew, however they were great together and genuinely enjoyed each others company and perspective. Judith has travelled extensively and shared her knowledge with George and he in turn I think brought a freshness to the experience for her. I worked with Judith for 6 yrs at Edith Cowan University where we became firm friends and having just spent a short time with George I was impressed with his sensitivity and no fuss outlook on life. Whilst they were only here for two nights we did a fair bit...I never get tired of being out and about in this landscape. The weather this summer has been absolutely beautiful, even getting up to a balmy 19°. The current church is the oldest stone church in Iceland and was erected in 1763, it is built from red sandstone from Hólabryða, a mountain that overlooks the site. Interior of the church at Hólar. Gorgeous baptisimal font carved in soapstone by artist Guðmundur Guðmundsson. where we sat in this space and just happily chatted for a half hour or so, there was a serenity here that pervaded the room creating a peaceful, relaxed atmosphere. On our way to Hofsós we stopped off and visited a tiny little chapel Grafarkirkja, built by Gísli Þorláksson, Bishop of Hólar 1657-1684. The church was deconsecrated in 1765 but the national museum of Iceland had it rebuilt in its original form in 1953 and recently re restored last year. a tiny building built for tiny people...definitely have to bend your heads here. A lovely carved altar, the artist is once again Guðmunndur Guðmundsson the same person who carved the baptismal font at Hólar...I like his style! Then stopped for lunch and chatted happily for sometime. The hardest thing about moving away from friends and family is that you have no history with people and whilst that is great in some respects and quite liberating it is still lovely to converse with those that know the same places and people you do...so Judith and I had a lot of catching up and chinwagging to do! while Judith and I continued chatting merrily away! We finished off the day with a sauna like soak in the Grettislaug hot pots before returning home at around 9pm for a late evening meal. It was really wonderful to catch up with Judith and meet George for the first time, they are now back in Australia, hopefully with fond memories of Iceland. Looks like you had a lovely time. Will we be able to visit any of these places in the winter? 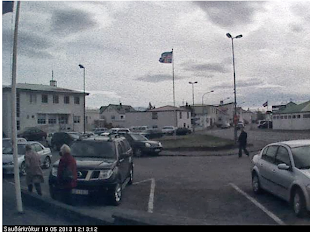 Definitely should be able to visit Hofsós and Hólar and there are a few quick easy caches you can do at Hólar. Just thought with the 4 wheel drive should still be able to do Grettislaug....a soak in a hot tub surrounded by snow could be nice! As usual, I loved the blog. Quite jealous of Judith, knowing what she was experiencing. So glad that they saw so much and look forward to catching up with Judith in Australia. Bern and I have just returned from our adventure on the trans Siberian railway and Mongolia (which turned out to be the highlight of the trip) and China. Will send some images and comments soon. The accommodation looks very classy Vicki, well done!! Would love to come back and visit but when are you planning a trip to Oz? let us know and I will book you into Moore River for a quiet few days on the river. It was great to catch up with Judith...I had a lovely time with them both. the weather was really lovely and warm...much more summery than when you were here last year. I am thinking about coming for a visit around Christmas next year...but nothing is locked in at this stage...it just depends on the business...but I will keep you informed. Yes please send me some pics of your trip.